Optimisez vos chances d'observer les animaux sauvages du parc national de Chobe au cours de cette excursion de 15 heures au départ des chutes de Victoria. Optez pour un safari à travers le parc et une croisière sur le fleuve Chobe avec un guide pour voir la faune sauvage dont les gros félins et les oiseaux tropicaux dans leur habitat naturel. Commencez votre excursion de 15 heures au parc national de Chobe par le transfert depuis votre hôtel de Victoria Falls avant 5:00. Un départ tôt le matin garantit de meilleures chances d'observer les gros félins et d'autres animaux nocturnes pendant l’heure de trajet jusqu'à la frontière à travers le parc national de Zambèze. À votre arrivée au parc national de Chobe vers 6:30, embarquez pour un safari dans le parc. Votre guide vous aidera à observer la faune locale, y compris les félins dans leur environnement naturel. Dégustez un déjeuner au Chobe Safari Lodge vers midi, puis profitez de votre temps libre pour vous détendre à l'ombre avant une excursion de 3 heures en bateau sur le fleuve Chobe. Repérez les oiseaux et les autres animaux sauvages tout au long de la croisière, qui se termine par une vue sur le coucher de soleil sur le fleuve. Retour à votre hôtel de Victoria Falls vers 20:00. Remarque : un minimum de quatre personnes par réservation est requis. Wir wurden pünktlich um 5 Uhr von unserem Hotel abgeholt. An der Grenze zu Botswana wartete bereits der Safari-Jeep, so dass wir kurz nach 6 im Park waren. 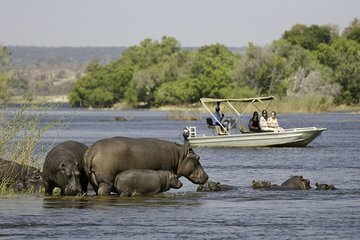 Viele Tiere waren zu sehen, besonders Elefanten, aber auch Hippos, Impalas, Zebras und und und ...Nach dem Mittagessen in der Safari Lodge ging es in einem kleinen Boot auf den Chobe, auch ein tolles Erlebnis. Mit das beste war, dass wir mit den Guides ganz allein unterwegs waren und die Tiere aus nächster Nähe sehen konnten. The experience was completely worth it. The drivers and guides were all very nice and knowledgeable. The safari guide was very accommodating to requests enabling us to see a lot of game. The River Guide was also very helpful with spotting animals and positioning us for good photos. We had a fantastic time! It’s a very full day- guides are fabulous and we saw SO many animals! It was absolutely amazing and I would recommend it to anyone! This is a wonderful tour that combines a land portion and a boat portion. Both guides were excellent and maneuvered the jeep and boat so that we could get a better view of the animals. Definitely TAKE THIS TOUR! Recommend this tour to anyone. Half a day in a safari truck after a transfer from Zambia thru Botswana border. Easy as! Great setting with all the water if the Chobe River. Saw the main wildlife including Lions. Great buffet lunch at Chobe Lodge and then a boat trip to view the wildlife from water! First let me say that the tour operators were great - Webster with DK Tours in Victoria Falls was very helpful and because of our experience on this trip we booked another activity with him, and Maobi was a good guide in Chobe. My rating is more related to the activities on the trip - they were okay, but not awe inspiring like other locations we visited. The game drive was done nicely, with a tea/coffee break in the middle, and our guide Maobi was quite knowledgeable. Unfortunately we were not very impressed by the animal viewing, although we kinda cheated on this trip by going to Kenya before Victoria Falls. If we had not seen vast numbers of animals at Amboseli and Maasai Mara just before this day trip we probably would have been much more impressed. If you haven't been on another safari recently you would probably like Chobe just fine. In Chobe we saw lots of elephants including quite a few family herds with cute little babies, lots of impalas, lots of hippos, lots of cape buffalo, giraffes, zebras, water bucks, and crocodiles and I'm sure I'm missing a few other animals. There were also a lot of guinea fowl, several fish eagles, and lots of other birds. The river cruise was not really a cruise, but more a short jaunt from one grounding to the next to look at animals on the island or mainland. I was quite surprised how close we got to the animals - within 2 meters of a couple of crocodiles, about 1 meter from a water monitor, and 3-4 meters from some elephants and buffaloes. We prefer to observe the animals in their natural habitat as much as possible, so practically running into animals just felt wrong to us. The boat motor kept dying - partly because it seemed to be poorly maintained and mostly because we kept running in very shallow mud. We would sit at one location for quite a while after everyone was done viewing or taking pictures of whatever animal/bird we pulled up to. Our impression is that the guide had to waste time because the actual area covered on the cruise is quite small - at times this got a little annoying. Also, there were about 30 boats all doing the same thing, and we were often touching or being pushed by other boats. Then we made a mad dash along the Zambia side of the river so we could get back around the island to watch the sunset, which was the best part of the trip. The trip itself was absolutely amazing! The organisation was fine, but not perfect: The trip includes hotel pickup, but I was never asked to provide which hotel we were staying at. Two days before the trip, I wrote an email to DK Tours and Safaris to ask if all is fine and tell them which hotel, but never got a reply in addition, it was very hard to find an actual email address for them on their partly broken and outdated website. Finally, the receptionist in my hotel managed to contact the operator and confirm the pickup, so all went well. Also, it was a bit annoying that visa fees may apply in addition, which are quite expensive for Zimbabwe - so this has to be taken into account beforehand. But this is mentioned in the description of the trip, so no hidden surprise. Chobe Game Reserve itself is worth visiting, it has a varied terrain from low bush, savannah plains, and the Chobe river with an amazing number of animals on an island in the river. We spent the morning driving and saw lots of elephants, buffalo, fantastic bird life, and some zebra. We also saw a six foot black mamba. In the afternoon we went on a small boat on the Chobe river which pulled up close to the island in the river, where we had a close up view of elephants, including a group with a small calf swimming across the river. We saw many crocs, several buffalo, and lechwe on the island too. Lunch at the Chobe Game Lodge was a plentiful buffet, but it was surprising to see the dresert crawling with bees. The trip back to Zimbabwe was a bit hair raising because we were delayed at the border which was filthy, poorly maintained, and we felt gouged as Canadians, as we were charged 75.00 cash for single entry visas, and other folk with us on the trip were not charged at all. We would recommend that visitors stay in Botswana and enjoy Chobe, and not go from Zimbabwe. It was a tiring trip lasting 16 hours, but our guides were friendly and professional. This was an amazing trip. We saw a hyena at night on the way there and a southern African wildcat on the way back. In the park we saw lions, giraffes, zebras, crocodiles, monitor lizards, hippos, water buck, sable, kudu, impala, and many beautiful bird species. The most amazing experience was a large herd of elephants that came into the water in the evening to play and drink, with lots of baby elephants as well.